The Fourth » Skärva always keeps a spare cape around. ALWAYS. Skärva always keeps a spare cape around. ALWAYS. Skärva isn’t exactly new to the concept of losing. He’s had to get right back on his evil horse many a time before. What, Skärva on a horse? Oh yeah, there were supposed to be windows in this place. But seriously, this one of my favorite pages yet. AND IT’S ALSO THE END OF THE FIRST ARC OF OUR STORY. Thank you so much for reading this far! Wednesday, get ready for Part 2… a new adventure, with more new characters to meet! Having lost so many times, I guess he sees just how HANDY her healing could be! Oh you and your tropes-based humor. Yep, yep, that’s the only reason. Lorelei: I have a family! Skärva: I have the best first-aid kit ever! I don’t care if he only cares about her healing powers, the last panel is so freaking adorable! Nope, she’s just there to decorate the banner, she’s never going to actually be in the comic. Ok, ok. You got the basic idea right, but there’s more to that, you’ll see. As well as surprising characters. I am very excited. side noat, u guys arent gonna end every arc with a sad ending r u? Do video games usually end badly for the villain? Knowing how things have always turned out for him, and how things turned out for his father, will Skärva keep trying? Will you keep reading? And will there ultimately be a happy ending at the end of this long twisted tale? answer two: yes. he just said he would. Reply one: Yes, but I said usually. Two: Yay, reading comprehension skills! That question was almost as hard as the ones on the tests we had to pass in order to graduate high school! Reply the Fourth: It would be really weird if you did because honestly I’m not even 100% on how things are going to end, although we do have much of the later plot already articulated. Also, it’s really not a SAD sad ending to this arc. It’s bittersweet. Just look at that last panel. Lorelei has a home now, and Skärva has someone new who he cares about. He has very very few of those so it’s a big deal. I mean, it sure could have worked out better for our crew of antagonists, but it could have been a lot worse. Skaerva: First, I’ll turn that meddling kid into a shrub! A harmless little shrub! And then I’ll put that shrub in a box, and then I’ll put that box in another box, and then I’ll mail that box to myself, and when it arrives… I’LL LIGHT IT ON FIRE!! AH HAHAHA! It’s brilliant, brilliant, brilliant I say! Stop making me nearly burst out laughing in class. ….No, don’t, I should just stop looking at comments in class. An endless loop of Killing with Ice / Killing with Fire? Brilliant AND Troperiffic! I don’t think Lorelei can bring people back from… uh, that. =P She’s a healer, not a necromancer. But up until that part, solid plan. Yes! Lorelei will become a valuable asset! Chests of never-ending capes ftw! I’m glad Lorelei has a new home, even if it is with a megalomaniac overlord with a penchant for lunch meat. A new home – more like the only home she’s ever had, in the short amount of existence that she can remember. So I guess she doesn’t know any better. =P I have a feeling that if Skärva and Derk hadn’t happened along, she would’ve been taken in by Lomurcio or that sandwich guy. Life would have been a lot less exciting. 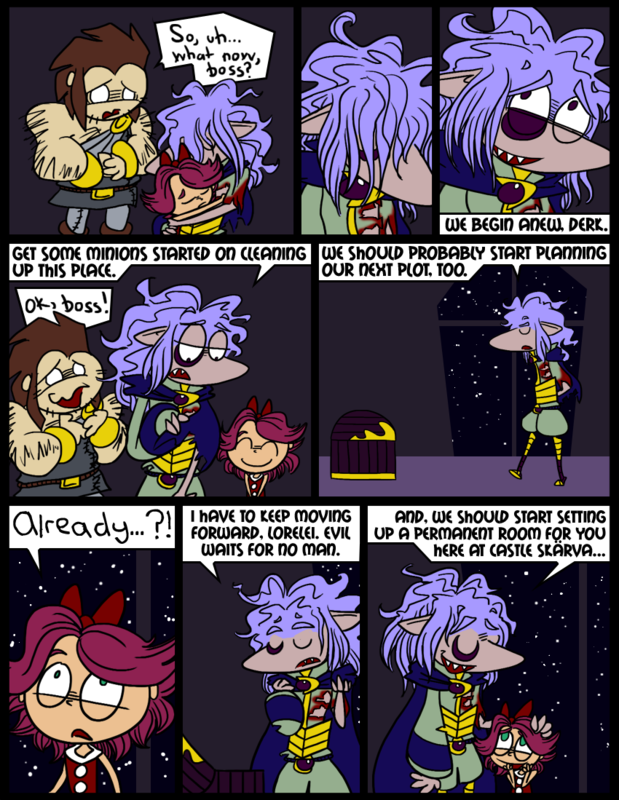 So, this is an old strip, but I have a question: Why didn’t Blank open that chest? Did he just figure out, after a dozen boss battles and a dozen Cape of Evils, that there was no particular reason to? Actually, if Blank never opens the boss room chest, then Skarva could hide the magic artifact there.